While it would be a stretch to call Flame a hero themed pokie, it certainly gives off the unmistakable impression of one. It doesn’t feature crime fighting or secret identities, but it does feature an iconic lead character. The purple haired rock star you meet in Flame has a fantastic look. You will see her purple hair often on the reels as she serves as this pokie’s wild. Flame is a title from developer NextGen who have gone all out with this one. It features 7 randomly triggered bonus features as well as a very high RTP and of course some great graphics to boot. During the base game you see a light purple flame burning at the bottom of the reels but once those random features tart kicking in you will notice why they call this game Flame. The whole screen along with the reels will burst into flame when a random bonus feature is about to be triggered. There are 7 special bonuses that can activate at random while you are playing Flame. These features can also activate during your free spins round more often for some truly big winning potential. The Flare Up – This feature adds additional multipliers to the reels for a maximum win of 10x your staked wager amount. Live Embers – This feature adds more of the wild symbols to the reels. 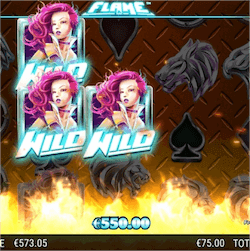 Firestorm – Your wild and bonus symbols will become one and the same, meaning your odds of landing a big win increases. Wild Inferno – This feature adds sticky wilds to the reels. Fire Whirl – this feature awards you with instant cash prizes. Cross Flare – Your paylines essentially get doubled as they now pay both ways. Spontaneous Combustion – Upgraded symbols are added to the reels that pay out bigger prizes. NextGen have raised the RTP to an impressive 96.61% here. The wager limits start at 0.15 and they can be raised to 75. There’s a nice big 200 000 jackpot prize that can be won as well, showing that NextGen have covered pretty much all the bases here with their new pokie title. Flame is the perfect mascot for the company and it should be another classic for their pokie library which we are sure many operators would be most excited about..